Newcastle Yacht Club is situated at the foot of the Mourne Mountains, Northern Ireland. The original boats used by the club were Seaflys as they were thought to be the most suitable for the conditions encountered in Dundrum bay. Indeed, in the 60’s the Seafly was the only boat sailed in Newcastle – most were built in Ireland by Lesley Hanna – but 2 boats, nos. 243 and 245 were home builds. At one time there were approximately 20 boats in the club (some of the sail numbers were 30, 33, 50, 168, 188, 194, 195, 242, 243, 244, 245, 246, 247, 482, possibly 614, and 689(? ), although the hull number for the last one may be different). The club still holds an annual “Seafly Championship”. Our 2012 event was in August. We thought we may struggle to get enough boats and we had the potential of 7 boats but ended up with 5. It was great to see them racing on Dundrum Bay as they have done for around 50 years! 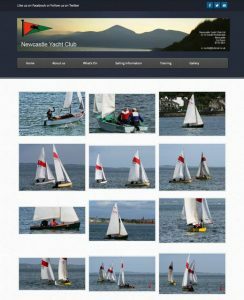 Pictures of the 2 days racing (see image left) are in the galleries section of the clubs website: www.newcastleyachtclub.co.uk.